I generally put a lot of thought into the each species of tarantula I buy. Like many hobbyists, I have a long wish list of animals that I have thoroughly researched with the anticipation that I will one day acquire them. There are never impulse buys, and when I pull the trigger, it’s usually on something I’ve been eyeing for months. Every so often, however, I take a chance on a species that I’m not as familiar with and that might not have been in Tom’s Top Ten to Be Acquired list. My C. guangxiensis was one of these species. My first exposure to this tarantula came when I found a small juvenile female listed for sale at Jamie’s Tarantulas. Although I was familiar with this tarantula’s cousins, Chilobrachys fimbriatus and dyscolus, I had never heard of this Asian terrestrial with the seemingly unpronounceable scientific name. I quickly Googled this spider and found that, although it didn’t sport the beautiful blues of a C. dyscolus blue, or the amazing tones and patterning of the fimbriatus, there was still something undeniably beautiful about this T. When I discovered that the care of this species was the same as others from the genus, I decided to grab her up. A gorgeous, sleek, velvety-brown species from southern China. Like other species from this genus, the C. guangxiensis is a fast, slightly defensive obligate burrower that requires a bit of extra humidity and deep moist substrate to thrive. As this faster growing species, I afforded her a bit of extra room to grow and gave her a larger enclosure than I normally would for a spider that size. This also allow me more room for maintenance. Her first home was repurposed 7.2 quart Sterilite plastic storage container that measured about 11″L x 7.5″W x 8″H. Both ends of the container are vented to allow for good cross-ventilation and adequate air flow. Although this species appreciates a bit of extra humidity, I’m always careful to avoid creating the stuffy, stagnant conditions that could harm or kill a T. I provide a water dish at all times for drinking and for added humidity. When I received my female, she was about 2″, so I gave her an enclosure with about 5″ of substrate depth in which to construct a burrow. For substrate, I use a mixture of 40% coco fiber, 40% peat, and 20% vermiculite. I find that this blend not only holds moisture well, but it also absorbs water more readily when it comes time to moisten it back up. The sub is damp, but not wet; if you squeeze it in your hand, it will hold its form, but no water will drip out. Once a month or so, I will use a bottle modified to be a watering can to make it “rain” and moisten down half of the substrate. A hide really isn’t necessary for this species, as if it is given enough substrate, it will quickly dig its own burrow. Before I added it to it’s enclosure, I just created a small hole/starter burrow in the corner. It quickly adapted this hole and used it to create its home. It now has two entrance holes and a large open den at the bottom of the enclosure. I’ve observed no specific temperature requirements for this species. Mine is kept at 70-77° F during the winter and 75-84° F during the warmer summer months. She has eaten well in both ranges, although higher temps usually lead to higher metabolisms and faster growth. Just add crickets and watch it grow! The C. guangxiensis is a medium /fast growing species that can reach 7″ in size. 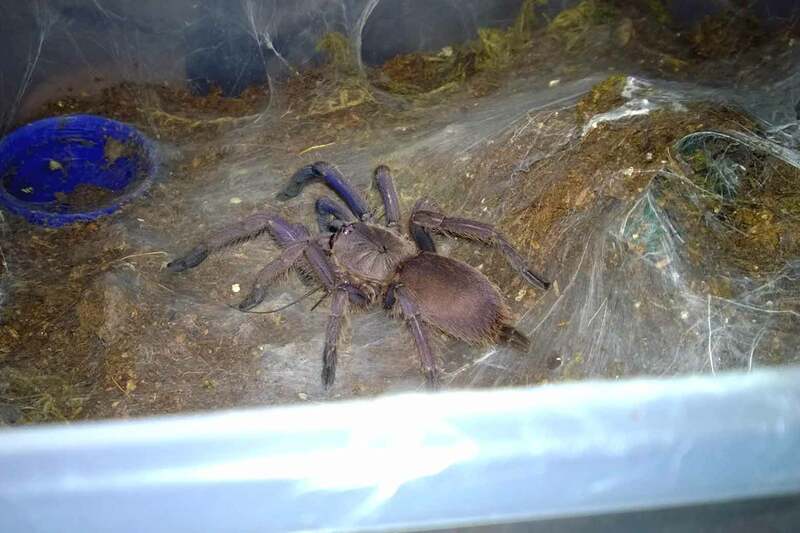 My female has molted three times in the eight months that I’ve kept her, and she has gone from 2″ to about 3.5″. She is a voracious eater, taking down prey with lightning speed before quickly dragging it down into her den for consumption. As a juvenile, she was eating 3 medium crickets a week. Now that she is a bit larger, I’ve been feeding her two large crickets a week. If there will be any knock on this species, it might be that it can be a bit of a pet hole. Of all of my obligate burrowers, this one might be my most secretive. I sometimes catch it out after the lights go out for the night, or early in the morning, but she will bolt back into her den at the slightest disturbance. This has made it very tricky to photograph. Still, when I see her out an about, it is a true thrill. This one can throw down the silk. It should be noted that some keepers have been successful keeping their Chilobrachys species on more shallow substrate with a hide. These species can be prolific webbers, festooning their enclosures with copious amounts of thick webbing. Specimens denied the opportunity to dig will build elaborate homes out of their webbing. Personally, I like to let them burrow as the deeper depths of the substrate can provide them with a secure and more humid place to retreat to when frightened or when they need more moisture. 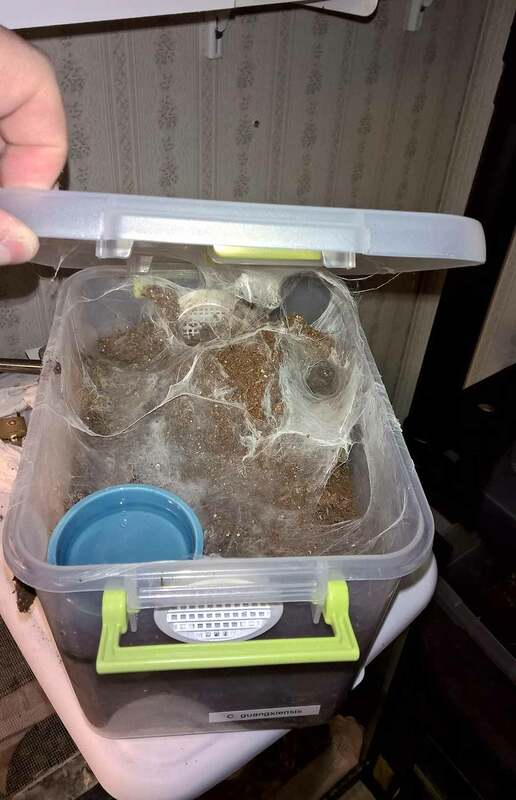 My C. guangxiensis has webbed up her entire enclosure with thick web. Even though she has a den, she will come out at night to lay down more silk, and she will often web the top of her enclosure shut. As a result, I open her cage several times a week to remove the webbing on the lid. My C. guangxiensis’ enclosure. I have to open this one quite often, even when not performing maintenance, as she will often web the top shut. A beautiful addition to an intermediate collection. Unfortunately, with so many more colorful and easier to keep tarantulas available, including other members of the Chilobrachys genus, I worry that the C. guangxiensis sometimes gets overlooked. Pictures just don’t do this specimen justice, as its slick, shimmering coat and lithe, athletic build make it a stunning specimen in its own right. And although I’ve seen many photographs that make it appear to be a simple, plain shade of brown, its true tones are difficult to describe and must be seen to be appreciated. For those used to Asian terrestrials, including their attitudes, speed, and care requirements, the C. guangxiensis would make a great addition to the collection.